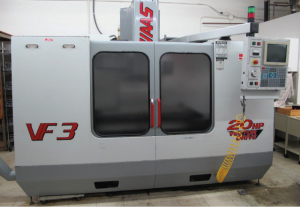 2000 Haas VF-3 4-Axis CNC Vertical Machining Center s/n 19670 w/ Haas Controls, 20-Station ATC, CAT-40 Taper Spindle, 10,000 RPM, 20Hp Vector Drive, Brush “A” Axis, Rigid Tapping, Programmable Coolant Nozzle, Coordinate Rotation and Scaling, Floppy Disc, I/O-N S or Later, Haas Vector Spindle Drive, WYE-Delta Spindle Motor, Sigma Motors on XYZ Axes, Quick Code, M19 Spindle Orientation P & R Codes, Chip Auger, 18” x 48” Table, Coolant. Bridgeport / Proto Trak 3-Axis CNC Vertical Mill w/ Proto Trak MX2 Controls, 1.5Hp Motor, 60-4200 Dial Change RPM, Chrome Ways, 9” x 42” Table. Hardinge HLV-H Wide Bed Tool Room Lathe s/n HLV-H-7441 w/ 125-3000 RPM, Inch Threading, Tailstock, Power Feeds, Trava-Dial, 5C Collet Closer, Hardinge Tool Post, 5” 3 and 4-Jaw Chucks, Coolant. Mori Seiki MS-850 Geared Head Gap Bed Lathe s/n 6907 w/ 32-1800 RPM, Inch Threading, Tailstock, Steady Rest, Trava-Dial, Aloris Tool Post, 10” 3-Jaw Chuck, 12” 4-Jaw Chuck, Jacobs Flex Collet Speed Chuck, 16” Faceplate, Coolant. Boyar Schultz Challenger 2A Deluxe 6” x 18” Automatic Hydraulic Surface Grinder s/n CH-1151-2A w/ Hydraulic Feeds, 6” x 18” Magnetic Chuck, Coolant. 2004 Atlas Copco GX4 FF 10Hp Rotary Screw Air Compressor s/n AII642641 w/ Digital Controls, 4066 Metered Hours, 60 Gallon Tank. Powermatic mdl. 143 14” Vertical Band Saw s/n 743178 w/ 40-300 FPM, 8-Speeds. W.F. Wells mdl. AC-7 7” Horizontal Band Saw s/n 99640 w/ Manual Clamping, Coolant. Temple Associates Dry Blast Cabinet w/ Dust Collector. Cuttermaster mdl. “5C AIR” Tool and Cutter Grinder s/n 732027 w/ 5C Air Fixture. (3) Baldor Pedestal Grinders and Pedestal Buffer. Rexon 14” Bench Model Drill Press. Ryobi 10” Table Model Drill Press. Media Tumbler w/ 11” x 21” Tub. (40) CAT-40 Taper Tooling with Huot Toolscoot 40-Taper Tooling Cart. (2) Kurt 6” Double-Lock Vises. (4) Kurt 6”, 5” and 4” Angle-lock Vises. 3” Precision Machinists Sine Vise. 6” x 12” Sine Table. (65) 5C and (14) R8 Collets. 6” x 12” Magnetic Chuck. Bridgeport 12” and Herter 8” Rotary Tables. Bridgeport 90 Degree Milling Head and Arbor Support. 5C Indexing Head and Spin Fixture. Ellis 5” 3-Jaw Compound Dividing Chuck. News 6” x 8” Adjustable Angle Plate, Angle Masters and Angle Plates. (3) Procunier and Tapmatic Tapping Heads. (7) Huot Drill, Tap and Endmill Cabinets. Drills, Taps, Reamers, Countersinks, Endmills. Mitutoyo 18” Dial Height Gage. MicroVu mdl. 500HP 10” Optical Comparator s/n 22002 w/ Acces. SCM 40” and Kanon 24” Vernier Calipers. Mitutoyo and Starrett 12” and 6” Dial Calipers. Mitutoyo and Scherr Tumico 0-6” Depth Mics. Mitutoyo 0-1” Digital, 0-1” Disc Mic, 0-1” Blade Mic, 0-1” Anvil Mic. Starrett 0-3” Depth Mic and 0-1” Anvil Mic. Peacock .75”-1.45”, .37”-.73” Dial Bore Gages. (2) Mitutoyo Matched V-Block Sets. Dial Test and Drop Indicators. Mojave 24” x 40” x 4” Granite Surface Plate w/ Stand. Standridge 24” x 36” x 4”, 18” x 24” x 4” Granite Surface Plates w/ Stands. (7) Metro Wire Frame Shelf Carts. Cabinets, Shelving, Shop Carts and Office Furniture.